The roboport is the resting place for all construction robots and logistic robots. It emits an area of 50×50 tiles, in which logistic robots can interact with logistic network entities, such as storage chests, or requester chests. Additionally, a 110×110 tile area is created for construction robots to repair, construct or remove structures. This can be seen by hovering the mouse on a roboport, or logistics chest which is inside the logistic zone. The smaller orange square represents the reach of the logistics network where both logistics and construction robots can move. The larger green square represents the extent of the construction network where only construction robots can move. Robots placed into the air from the player's inventory inside of a roboport's coverage will seek out the nearest roboport to charge and rest. Two or more roboports can connect to form a robotic network, if the borders of the orange logistic areas touch. This is shown by a dotted line running between the two ports. An example of this can be seen on the bottom-right. Non-connected roboports will not share robots. Two roboports connecting to form a logistic network. Notice the yellow dotted line indicating a successful bond. A roboport contains 7 slots reserved for robots, and another 7 for repair packs. Robots and repair packs can be inserted into, or out of, the roboport with an inserter. Repair packs inside a roboport are available for all robots and requester chests inside the logistic zone of that roboport. Construction bots, when provided with repair packs, will automatically repair all damaged structures inside of a roboport's coverage area. If a roboport is full of robots, robots attempting to rest will find a different roboport, if one is available. 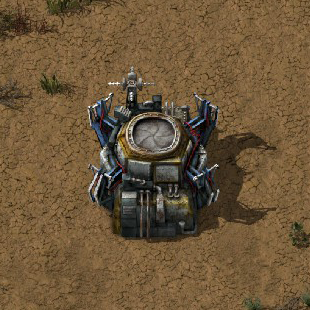 Roboports have 4 chargers, which are used to recharge the flying bots. More roboports in a small area will allow for greater charging throughput, if a lot of robots need charging. Robots waiting to be charged will float in place near the roboport and wait their turn. Robots will not enter a roboport to rest unless they have full charge. Robots with low/no charge can still fly, but will move extremely slowly. Increased the stack size of roboport from 5 to 10. Roboports now provide the repair packs they have for other robots to use. 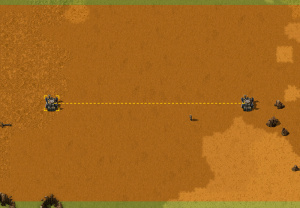 Increased roboport construction range to 55 (110×110 area) to make roboports able to build each other without interconnecting their logistic areas, and not break when there are obstacles like trees or rocks. Roboport construction area changed from 50 to 51 to allow roboports build/deconstruct each other even when there is a 1 tile gap between their logistic areas. Roboport is connectible to the circuit network, it sends the logistic network contents or the robot statistics of the network. Reduced number of drawn connections between roboports again. Robots can charge from a closer roboport on their way to a more distant one. Reduced number of rendered roboport connections. 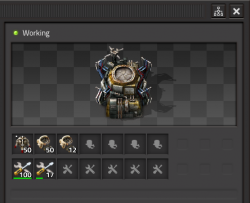 Inserters can now extract from roboports. Optimized adding and removing roboports, robots keep their tasks if possible. Roboport gui labels updated to state "Roboport"
Roboport is no longer categorized as a military structure. Backer names are used to name roboports. Area visualizations for roboports are displayed under their entities. Only repair packs may be placed into the roboport slots. Roboport supply area increased from 40×40 to 50×50. This page was last edited on 2 February 2019, at 05:06.